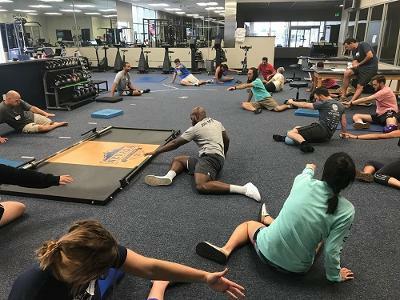 The "Biggest Little City", Reno, NV at the University of Nevada, sponsored its first ever PRI course July 14-15 in the Nevada Physical Therapy Sports Medicine Complex. Attendees were not only local in number but traveled from Utah, Indiana, Washington State and Southern California to attend Postural Respiration. This weekend had a powerful combination of didactic class work balanced with lab every step of the way during the weekend. PRI concepts were discussed and demonstrated to bring experience to what assessment and treatment of tri-planer respiratory function looks and feels like when a person is "lateralized", "sagittalized" and then achieving neutrality with non-manual and manual techniques. One of the students who volunteered to be assessed and treated demonstrated to the class that some cases in clinic are more challenging than others. For example, non-manual techniques were not working to allow his femurs to adduct. He was a strongly patterned Superior T-4 with an athletic background. Then, manual techniques did not work including a two person infra-clavicular pump. A brief discussion on footwear, occlusion and vision followed with no progress on his femurs adducting or any other tests becoming neutral. After a break, a 90/90 hip lift with right arm reach and a balloon (without the stress of being a lab subject in front of the class and any performance pressure) provided immediate neutrality of his pelvis and improvement of BC testing. The big take away is to always stick with it and think outside the box of possibilities including a basic PRI non-manual technique that provided much needed inhibition to his neurologic/respiratory system. My mentor and friend James Anderson, P.T. said in my first PRI class, Postural Respiration, that your patients just want to relax! Sticking with your patients and not giving up plus practitioner and patient relaxing is a strong step towards effective clinical outcomes! Shout out to Jay Henke for doing all of the behind the scenes work to make this first ever PRI event at UNR! And shout out to all of the students for being such a solid class, helping each other out and adding this power tool to their clinical tool belt! The response from the locals at UNR is that they want more PRI courses to follow!